"Constant engineering innovation in our products is the best way to serve our customers. We asked a simple question - "What do customers want for coloring their composite products today?" The wish list we heard - a pigment that would work very well with a variety of resin systems, pigments that give defect free and high appeal coloring, pigments that mix easily with resins and pigments that flow easily out of the jar. We started our design with the goal of developing a single pigment system that could color all three of the most popular resin systems in the composites industry - Polyester, Epoxy and Polyurethane. We figured out that the key would be to develop a pigment polymer vehicle that would have high affinity for pigment particles and the three types of commercial resins. We accomplished this through the introduction of surface active molecules into a unique polymeric chain. This gave birth to our EzFloMix™ Kerox Universal Pigments, along with a plethora of performance benefits. My personal opinion is that EzFloMix™ has advanced the state-of-the-art in composites coloring. The feedback from customers has been very positive and they are finding real value in our product." 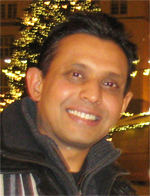 Prakash earned a Ph.D. (1993) and an M.S. (1990) in Chemical Engineering from the University of Rhode Island, Kingston, USA. He earned a B.E. (1989) in Chemical Engineering from the Manipal Institute of Technology, Mangalore University, India. He has been the recipient of the Founders Club Award, and was inducted into the University of Rhode Island College of Engineering Founders Club, in recognition of the importance of entrepreneurship in the field of engineering and the world of industry, Rhode Island, USA (2004). He was also the recipient of the Distinguished Alumnus Award, in recognition of long and distinguished professional service to the Alma Mater & Society, awarded by Manipal University, Manipal Institute of Technology, Manipal, India (2007). Prakash can be reached at prakash@kerox.org. "It’s my view that composite raw materials should technologically upgrade to meet modern manufacturing practices. This is especially true for the global market scenario. Development of EzFloMix™ Kerox Universal Pigments has made our operations and logistics efficient and practical. Our customers have appreciated its usefulness in their manufacturing processes and they see EzFloMix™ as the Next Generation Pigment for coloring composites." 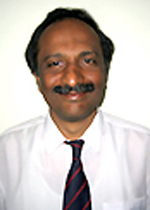 Mallesh has 30 years of experience in engineering, management and marketing. Prior to joining Kerox he has held positions at Apollo Tyres and J.K. Tyres. He earned a B.E. (1986) in Mechanical Engineering and M.E. (1988) in Management from SJCE, University of Mysore. He is also a certified ISO 9001:2000 Internal Auditor. Mallesh can be reached at mallesh@kerox.org. Kerox was built by the late visionary, scientist and founder K.V.Ramanath (1934-2002). His passion was science and his contributions numerous. In the 1960's fiberglass reinforces plastics was an obscure and unknown field in India. Ramanath was intrigued by this technology, but there was scant availability of raw materials and resources, and much of what was available was being imported from UK. His investigations eventually inspired him to indigenously research and develop our first product in 1968, ME-50 MEKP (Methyl Ethyl Ketone Peroxide) catalyst, for room temperature curing of polyester resins. This was a great success in the market because of its quality and reliability. 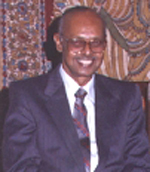 Prior to starting Kerox, Ramanath earned in the 1950's a B.Sc. from Madras Christian College and a B.Sc. (Tech) in Paint Technology from the University Department of Chemical Engineering, Bombay. His background in Paint Technology led him to research and develop the Kerox Range of Polyester and Epoxy Pigments, which are color dispersions for coloring FRP. During his career spanning over 40 years he has researched and developed key raw materials for the FRP industry - Methyl Ethyl Ketone Peroxide (MEKP), Polyester and Epoxy Pigments, Cobalt based Accelerators, Tertiary Butyl Perbonzoate, Tertiary Butyl Hydroperoxide, Di-Tertiary Butyl Peroxide, Low Profile Additives for SMC/DMC and Pigment Grade Resins. To his credit he has many other innovations in allied fields. Kerox today continues to serve and innovate in the FRP industry under the founding principles laid out by K.V. Ramanath - to deliver a high quality product to the customer at a great price value. As the founding father of raw materials for the FRP industry in India, his departure and achievements continue to inspire the current leadership of Kerox and many new entrepreuners. 1965 R&D of MEKP Catalyst and Pigments for Polyester Resins. 1997-2001 Development of barrier creams and super adsorbant polymers. 1968 Incorporation of Kerox Chemical Corporation as a Proprietorship by K.V. Ramanath. ME-50 MEKP Catalyst and C-20 Cobalt Accelerator sold as our first products in the Indian market. Factory located at Rajajinagar Industrial Estate, Bangalore, Karnataka, India. 2002 Dr. Prakash R. Kota appointed as Managing Director of Kerox Chemicals Pvt. Ltd.
1969 Pilot plant production of Polyester Pigments. 2003 Development of Heavy Metal Free Pigments, Accurelease mold release based on PVA chemistry and Pigments for Polyurethane resins. 1970 Scaled up production of Polyester Pigments. 2006 Mallesh D.R. joins the Kerox team. 1974 Development of pigment grade Polyester Resins. 2007 Barrier cream, InviGlove, developed and launched. 1975 Introduction of Epoxy Pigments. 2008 Launch of KeroxIn commercial grade Polyester Resins. 1976-1980 R&D of Tertiary Butyl Perbonzoate, Tertiary Butyl Hydroperoxide, Di-Tertiary Butyl Peroxide, Low Profile Additives for SMC/DMC. 2009 Development of Acrylic Ester Co-Polymers for Cultrued Marble and Solid Surface. 1985 Construction of new factory in Basavanapura, Bannerghatta Road, Bangalore, Karnataka, India. 2015 Development of new Polymer with Surface Active Molecules in the chain. 1995 First export to the USA. Development and launch of EzFloMix™ Kerox Universal Pigments, a single colorant system for coloring Polyester, Epoxy and Polyurethane resins. 1996 Incorporation of Kerox Chemicals Pvt. Ltd., and amalgamation with Kerox Chemical Corporation.